The annual Consumer Electronics Show in Las Vegas that has been going on this week has served as a showcase for the next big things in the digital world. The VCR had its day, as did the debut of HDTV and, of course, the year of the tablet and Android devices. This time around, developers and big companies are rolling out everything from wearable computers to smart TVs that can connect to the internet and use apps. Just as the stars of each year’s CES shows have changed, as technology moves on, so have the tastes of consumers when it comes to the devices they use. A Gallup poll conducted Dec. 5-8 and released this week found that the number of Americans who have a basic cell phone that is not a smartphone has dropped to 45% compared with 78% in 2005 —a decline of 33 percentage points. The survey found generational differences when it came to the choice of basic cell phone versus smartphone. About nine-in-ten (88%) of 18 to 29 year-olds reported having a smartphone while only 24% had a basic cell phone. For Americans over 65, 61% had a basic cell phone while 25% had a smartphone. A Pew Research Center survey conducted April-May 2013 found that, for the first time in its tracking, a majority of Americans (56%) owned a smartphone of some kind. The survey found that every major demographic group experienced year-to-year growth in smartphone ownership between 2012 to 2013, although the lower level of ownership for those over 65 was similar to Gallup’s findings. By the way, that VCR, which had its debut at CES in 1970? It, too, has seen better days. 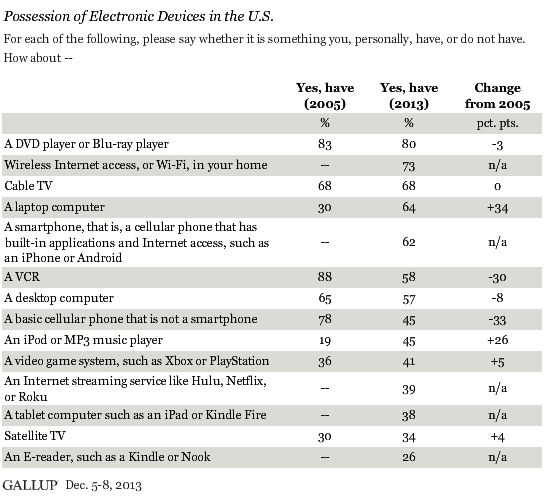 Gallup found a 30 point drop in VCR ownership since 2005, from 88% to 58%.